More than 10,000 unionists, opposition party supporters and members of the public took part in a march on Wednesday against the newly imposed electricity tariffs. The protest started from Campbell Park, Borella, and proceeded to the Fort. At the beginning of the protest, senior police officers requested protesters to refrain from marching to the Fort since a pro-government protest was heading towards the same destination as well. However the organisers told the police that they would take the risk and march to the Fort. Opposition leader, Ranil Wickremesinghe joined the protest with fellow UNP members Tissa Attanayake, John Amaratunge and Sajith Premadasa, along with the head of the Democratic Party, Sarath Fonseka, the Nava Sama Samaja Party’s Wickramabahu Karunaratne, Democratic People’s Front leader Mano Ganesan, former JVP MP Wasantha Samarasinghe and other political figures. Mr. Wickremesinghe addressed the crowd at the conclusion of the protest and said that the protests would not stop until the government revokes the new electricity tariffs. 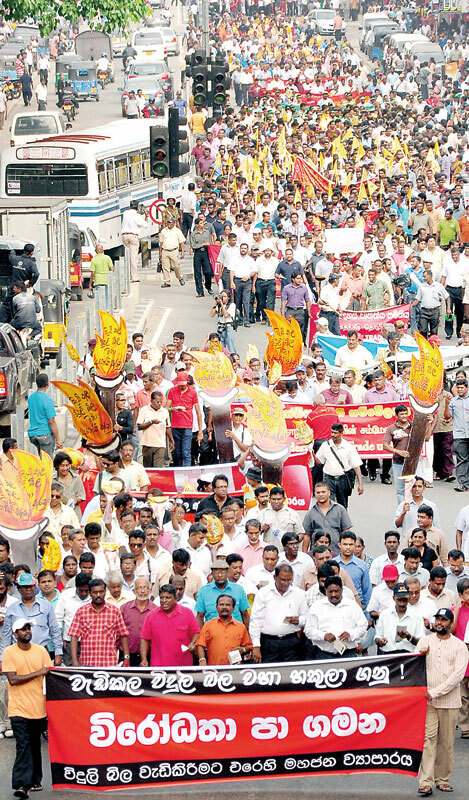 He added that the numbers joining the protest had proved that people were getting closer to ending the Rajapakse regime. Democratic Party leader, Sarath Fonseka told the protestors that if the government failed to provide the public with its energy needs more protests and strikes would be held until the government took the necessary measures for the public’s wellbeing.